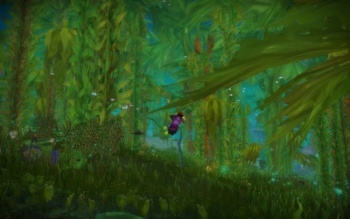 Last time around, I took a look at the undersea zone of Vashj'ir and got eaten by a giant shark, and fun times were had by all (except my poor gnome-shark-food mage, of course). I spent a bit more time questing around Vashj'ir and doing cool things like riding my own shark around and having it messily devour evil nagas (yes, you read that right) - but after a while, I could put it off no longer: It was time to get my dungeon-crawl on. The good news is, it's a lot easier to find a dungeon group in the Cataclysm beta than it was to do the same while testing the Wrath of the Lich King expansion, thanks to the Dungeon Finder introduced in a recent patch. You just click the button, hop in the queue, and wait for your group. The bad news is, if you aren't a healer or a tank it's still going to take you at least 20 minutes to put one together. The interesting news is that while people playing WoW on the live servers get matched with people from other realms in their group, in the beta it matched us with people on the other beta servers around the world. So when I finally got the invite to the Blackrock Caverns group, I found myself in a group with three people from the European servers and one from Korea. I greeted them - no response. Oh, right, that "language barrier" thing. Ah well, it shouldn't be too much of a problem, right? As the name would indicate, Blackrock Caverns is the third dungeon (well, technically fifth if you include raids) in the venerable Blackrock Mountain, home to the Classic-WoW Blackrock Depths and Blackrock Spire. 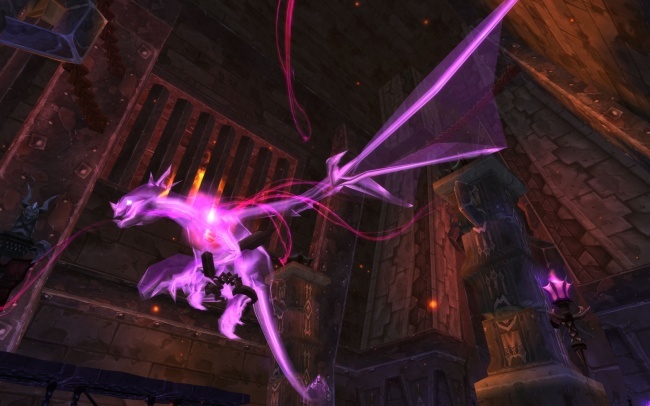 The Twilight cult is busy doing ... um, something in the name of their evil master Deathwing (it's beta; few of the dungeons have contexts yet) - go make them all dead. Sound simple enough. We started the run, started pulling the trash mobs and killing them, being careful not to stand in the very deadly fire grenades they throw. Obviously, "don't stand in the fire" is universal - clearly, this run was going to be a piece of cake. We all knew how to play, didn't we? After just a few pulls, we could see the first boss - a large, armored ogre lord - wandering around a cage that housed a monstrous mutated orc. After killing a few of the guards around the area, we pulled the boss - and then every other guard in the area joined the fight, and we all died. Ouch. One corpse run later (I hadn't realized how nostalgic that Blackrock Mountain corpse run was) we tried again, killing all of the guards first this time. The ogre had a few neat tricks - he'll teleport the group to him and chain them in place, and you need to destroy the chains and run away before he unleashes a short-range attack that kills everyone - but we finally managed to take him down. So far, so good. Of course, killing the jailer unlocked the cage containing the giant, mutated orc (that shoddy magical craftsmanship at work), but instead of attacking us he went on a rampage against our former captors, knocking an entire regiment off a bridge to their deaths. That handily cleared the way for us, and we proceeded down into the dungeon's depths. You can definitely tell that this is a Blackrock Mountain dungeon, as it retains many of the same artistic stylings as Spire and Depths - lots of black stone, dark iron, and lava flows - but has a "Twilight" theme to it (the cult, not the vampire books). There's lots of purples and cool fluorescent dragon specters to keep it visually interesting.